It has been just over a year since the world’s largest listeriosis outbreak hit SA, but the crisis turned out to be a boon for the pork industry which last year saw its highest fresh meat sales in three years. In just a few months shoppers who fled the cold-meats aisles turned to fresh pork, attracted by lower prices in the wake of the crisis. Johann Kotzé, SAPPO CEO in the Sunday Times. 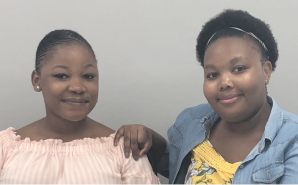 Leago Theko (left) and Nokuthula Mokwena joined the SAPPO team in March as interns in the Business Development Division. Martin Hobbs, een van die eienaars van New Quip Agri Supplies is besig om die Malawi-meer vir liefdadigheid te pak tussen die krokodille deur. Soon, many restaurant and hotel kitchens will have the meaty, umami aromas of delicious roasting pork wafting around. That’s when all the candidate chefs in this year’s Chef of the Year Competition start practising their pork dishes as part of their entry in this year’s Inter Hotel Challenge. 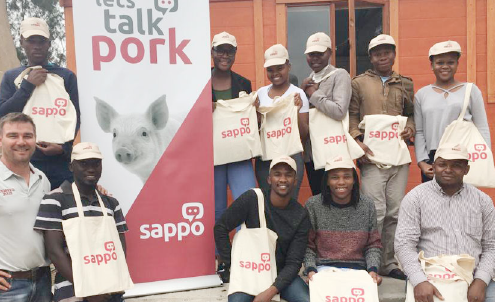 Producers have the opportunity to invest in SAPPO’s Monyetla Enterprise Development Initiative, that aims to raise funds to empower new pork producers to become commercial farmers. In return, there are great tax benefits for investors that partner with these new farmers, says Nico van Aardt, who heads the project on behalf of SAPPO. He is busy to establish two 500 sow units in the Bronkhorstspruit area with the support of the DRDLR. Contact him on 082 922 9538 or at nico@bethlehemagri.com. SAPPO and Novus presented an information day for Novus students at Keibees Piggery in March. SAPPO presented a farmer’s day at Onderstepoort on 27 March. The environment was in the spotlight. PIC would like to congratulate all the trophy winners of the Pig CHAMP data survey. January’s 2019 imports were more or less the same as in December. In January 2 917 tons were imported. The SAPPO staff had another team building session last week and on the menu was team building, how to face challenges and how to work together for SAPPO’s greater good. • The UK will be forced to accept laxer US food standards in a Brexit trade deal with Trump. Visit info hub. SAPPO’s 2019 annual general meeting and the conference will take place on 4 and 5 September at the Misty Hills Conference Centre, Muldersdrift, Gauteng. Registrations, including sponsorships, are now open. On 7 January 2019, an outbreak of Foot and Mouth disease (FMD) was confirmed in cattle in the Vhembe district of Limpopo Province. The outbreak occurred in the high surveillance area of the FMD Free Zone, immediately adjacent to the protection zone. The outbreak was reported to the World Organisation for Animal Health (OIE) and, as a result, South Africa lost its FMD free zone without vaccination status. Limpopo area. But more on the submissions and FMD in the Newsletter. At the AGM the strategic direction for the next 5 years was discussed and a roadmap proposed around key strategic directions. SAPA brought on an application for an increase in the rate of customs duty on frozen Chicken boneless cuts under the tariff heading 0207.14.1 and bone in portions under the tariff heading 0207.14.9. Amie made a submission that was submitted to ITAC on the 11th of January 2019. The ITAC application threatens our most important stakeholder group – the South African consumer. In order to ensure competitive trade, access to affordable and nutritional protein, and to safeguard the public against partial information, we need to inform the South African public of the facts in the industry. The South African consumer is to be burdened with yet another cost on a very important protein consumed by our population. 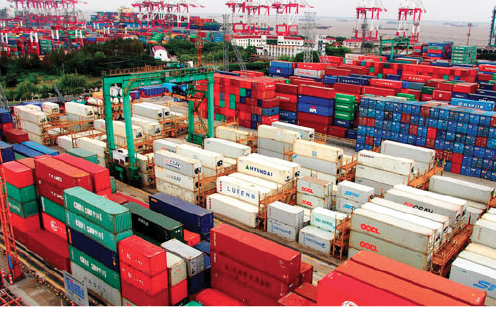 On Friday 1 February 2019, the International Trade Administration Commission (ITAC) published new guidelines on the AGOA rebate. Here are the changes with updates from Donald MacKay from XA International Trade Advisors. Issues relating to the port of Durban seem to be a long-term project requiring many more interventions and engagements between DAFF and AMIE in order to build an optimal solution which would be in the interests of Government and Industry. Late last year DAFF again implemented a randomised sampling at the Ports. DAFF indicated that it instructed all Ports at a very late stage. The randomised sampling was implemented, but there were no proper methodologies circulated which created uncertainty and confusion with members at the Ports. Consequently, other difficulties arose. There were no protocols to determine how lab samples should be treated resulting in inconsistent testing with the provisions of 2011 SOP and 2014 SOP. We will keep our members updated on any progress. Mike Burger (Lynca Meats) and Henry Shaw from Winelands Pork . Total imports were 48287 mt, compared to 57395 mt last December (2017) a 12-month average of 60244 mt. Total chicken imports excluding MDM, were 21589 mt compared to a December 2017 figure of 32947 mt and a 12-month average of 31999 mt. Pork ribs were 1458 mt compared to a monthly average of 1709 mt. Bone in chicken cuts were at 16319 mt, the lowest monthly figure of the year. Mutton offal is running at 17.6 % below last year. MDM is down a bit to 14218 mt, with an average of 12875 mt. We are going to have an interesting year! In order to keep abreast of all the issues, we have created the radar section. Amie will keep members informed and updated as these issues roll out. EU Safeguard discussion – Amie’s standpoint! 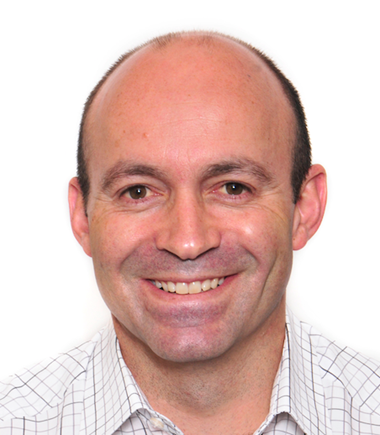 “If one had any doubts that registering a pig farm as an official pig compartment was worthwhile, then the latest FMD outbreak should change producers’ minds,” says Dr Peter Evans, who heads consumer assurance at SAPPO. A steering committee and three task teams were established on 14 January 2019 to soften the blow of the recent foot-and-mouth disease (FMD) outbreak in the Vhembe district. Dr Pieter Vervoort, chairman of the Animal Health Forum, who represents producer organisations on DAFF’s Steering Committee, said expectations were that South Africa’s meat trading partners would close their borders after the outbreak was announced and that the OIE would temporarily put South Africa’s FMD-free status on hold. The technical task team appointed by the Minister of Agriculture, Forestry an Fisheries, Senzeni Zokwana, met on 16 January 2019 and shared information and advice. • To limit the area being vaccinated to make the long-term management of the disease easier, provided this does not compromise the disease control efforts. • To increase police visibility. Everything you want and need to know about pig feeding, through to modern welfare techniques, and gene and genomic selection comes under the spotlight at the 2019 Ensminger Pig Symposium. 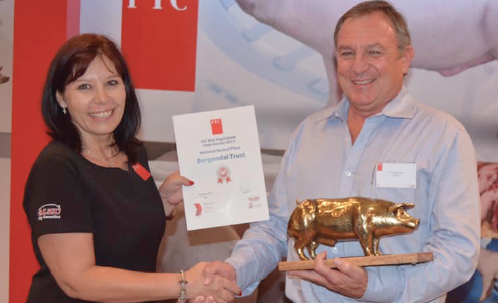 This co-located event to the centenary anniversary of the Pig Breeders Society of South Africa (PBS) will be hosted for the first time in Africa in Gauteng from 22 to 23 May 2019. Food Lovers Market’s annual Summer Carnival will start on Monday, 28 January and will end on Sunday 3 February. Pork will be the star of the show and it will be visible on television and in various publications. The launch of the SAPPO sponsored Drum Food Ambassador project is imminent. The February issue of the magazine DRUM, containing the announcement, will be available on 1 February. The digital version and the electronic banner communication to promote the project will be live on drum.co.za on 1 February. More information in your next Porcus. 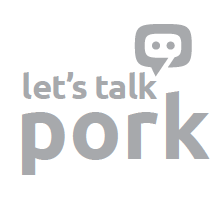 SAPPO’s new pink SA pork logo will be launched during the DRUM campaign. More news about this new, exciting consumer-directed logo will follow in Porcus. Click here to visit the hub. • How does disease surveillance work? 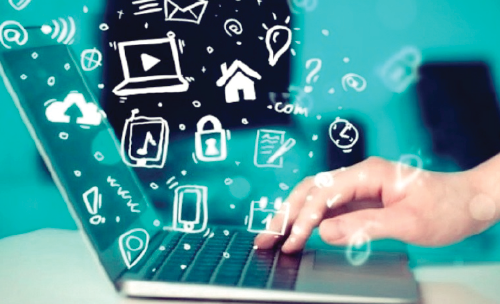 SAPPO is developing a new digital tool to update producers every week on what happened the past week, not only in the pig environment but also in agriculture, South Africa and in the world in general. We are also starting with an SMS system that will inform producers instantly of urgent matters. Agbiz head of Agribusiness Research Wandile Sihlobo has compiled a brief agricultural outlook for 2019. He highlighted the following take-home messages. • The South African beef sector will be under pressure in 2019 due to rising feed costs, as well as potentially slowing exports on the back of a foot-and-mouth disease outbreak. Average pork prices decreased by 4% since the last week of December. Compared to the same week last year, the average pork price is 5% lower. “Prices of poultry, beef and mutton also decreased. Pork prices may follow the decline in the prices of other livestock to stay competitive,” says Isabel Bröcker, who heads SAPPO’s business intelligence division. Last year, pig market expert Dr John Strak warned that it was time to be cautious about developments in 2018. Looking back, reality has proved him right – and he’s not overly optimistic for the next 12 months. As 2018 is only just behind us, I am bound to look back before looking forward to surmising how the global market for pigs and pork may behave in 2019. Gerard Braak het vir etlike jare diep spore in die georganiseerde varkvleisbedryf getrap, maar hy het nou besluit dat hy sy kant gebring het en dat ‘n jonger generasie die leisels moet oorneem. Gerard is ‘n vorige voorsitter van die PPP en het SAPPO ook as nasionale voorsitter gelei. Hy het ook in verskeie spesialiskomitees soos SAPPO se oudit-komitee gedien. Hy was een van die eerste produsente wat dit met sy besigheid buite die plaashek gewaag het. 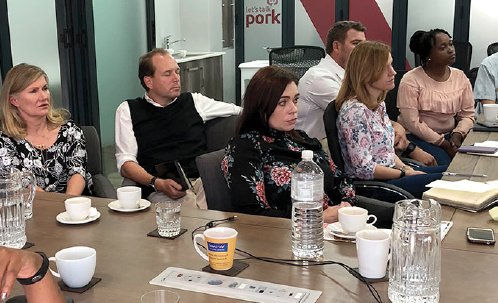 Globally, traceability is the cornerstone of all consumer assurance programmes and is also an important component of the local pork industry’s ability to export pork derived from compartments. SAPPO has identified GS1, a well-known international standard as its traceability method. You are welcome to join SAPPO’s delegation to the European Pig Producers’ Congress from 5 to 6 June in Landshut, Germany. You will be responsible for your own costs. 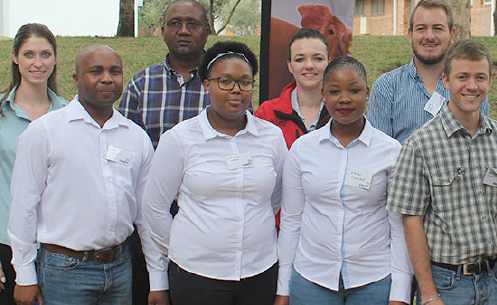 The South African Meat Processors Association (SAMPA) has donated R1 million towards the activities of Stellenbosch University’s Centre for Food Safety. SAPPO’s 2019 annual general meeting and the conference will take place on 4 and 5 September at the Misty Hills Conference Centre, Muldersdrift, Gauteng. 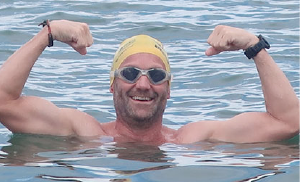 Registrations, including sponsorships, will open on 4 March 2019. The Animal Feed Manufacturers Association took members of the media to visit Meadow Feeds’ state-of-the-art feed mill in Standerton. The mill makes use of the latest technology and is more energy efficient compared to other mills. More in your next Porcus. Agri SA’s members have the potential to supply the electricity needed to prevent future load shedding through solar power generation. There are already 500 applications for solar generation plants, that have the potential to contribute 1 400 MW to relieve strain on the grid. Transformation of deciduous fruit farms as a tool of job creation. Die bek-en-klouseer uitbreking kom in ‘n tydperk waar die bedryf onder ’n landswye droogte gebuk gaan. Voer- en mieliepryse het die hoogte ingeskiet en die koopkrag van die verbruiker is onder druk. Dit is te midde van ‘n kuddeboufase ná die droogte van 2016. Al dié faktore plaas baie druk op die kontantvloei en finansiële oorlewing van produsente. Alles verteenwoordig ‘n uitdaging vir die missie van die RPO wat daarop geskoei is om vir die produsent ‘n mededingende en volhoubare rooivleisbedryf te fasiliteer. Daar is die afgelope jaar (Januarie tot Desember 2018) 29 180 ton beesvleis uitgevoer, wat 4.02% van die plaaslike produksie is. Die markwaarde van die uitvoere beloop R1 790 918 024-73. Gedurende dieselfde tydperk is 701.2 ton skaapvleis met ‘n markwaarde van R43 164 652-36 uitgevoer, wat 0.69% van die plaaslike produksie is. Altesaam 16 474 815 skaapvelle ter waarde van R594 182 260-36 en 8 552 648 kg huide ter waarde van R102 445 668 is uitgevoer. The FMD outbreak comes at a time when the industry is suffering from a country-wide drought. Feed and maize prices have escalated and the consumer’s purchasing power is under pressure. This is in the midst of a herd rebuilding phase after the 2016 drought. All these factors put the producers’ cash flow and financial survival under pressure. All these factors represent a challenge to the mission of the RPO which is based on the facilitation of a competitive and sustainable red meat environment for the producer. In the previous year (January to December 2018) a total of 29 180 tonne beef has been exported, which represents 4,02% of local production. The market value of these exports amounts to R1 790 918 024-73. During the same period 701.2-tonne sheep meat has been exported at a value of R43 164 652-36, representing 0.69% of the local production. 16 474 815 sheepskins to the value of R594 182 260-36 and 8 552 648 kg of hides to the value of R102 445 668, were exported.